Organized by Mid Atlantic Athletic Club & Sanctioned by Bermuda National Athletics Association. This course has not been certified. Start: Lindo’s Family Foods Warwick. Run Route: Along Middle Road through the South Road roundabout, continue on South Road. Left at Collectors Hill to Middle Road. Left onto Middle Road, left at Chaingate Hill, right onto Watlington Road, left onto Brighton Hill Rd and then left into Lindo’s parking lot for finish. 1st, 2nd, 3rd and 4th Male and Female Overall; 1st & 2nd- Male & Female Junior (Over 12 and under 20), Open (20 to 39), Master (40 to 49), Senior Master (50 to 59), Veteran (60 – 64), Senior Veteran (65 -69), Experienced Veteran (70+). ALSO Top school competitor prize (school with the most number of pupils who enter either the run or walk) & Corporate Prize (Company with the most number of participants who enter either the run or walk). 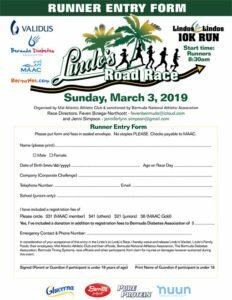 Enter online at RaceDayWorld or download the printable 10K Runner entry form and drop off at Sportseller, Lindo’s Family Foods, Lindo’s Market or The Diabetes Resource Centre. Printed/Paper Entry Deadline: Wednesday, February 27th, 2019, 5:00 PM at all drop off points. Late Entry: $56 March 2nd, 2019 at BSCP (National Stadium) or online at RaceDayWorld. Online entry deadline: March 2nd, 2019. (Please note that $8 per entry is now payable to BNAA in lieu of BNAA Registration and is included in the fees above). Early: Bermuda Sports Centre Pavilion (“National Stadium”) – Saturday, March 2nd, 2019 – 9:30 am to 12:00 pm. Use the entrance on Roberts Avenue (gate closest to Palmetto Road). Please follow posted signs. Walk Route: Along Middle Road through the South Road roundabout, continue on South Road. Turn left up Brighton Hill and turn right into Lindo’s parking lot for finish. Competitive Walker 1st, 2nd & 3rd. Prizes apply to Competitive Walkers and 1 under 20 prize. ALSO Top school competitor prize (school with the most number of pupils who enter either the run or walk) and Corporate Prize (Company with the most number of participants who enter either the run or walk). Participants can register for either Competitive Walk or Fun Walk. Note: Running not permitted to win prizes. Marshals will be enforcing this rule! 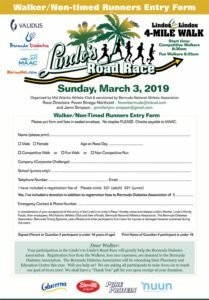 (Please note that $8 per entry is now payable to BNAA in lieu of BNAA Registration for Competitive Walkers and is included in the entry fees above). This is a charity WALK event; consequently, there is no MAAC membership discount available.